"You're starting to see pictures, ain't you?" That's an excellent quote from Samuel L. Jackson in The Hateful Eight, which is one of the best films of the year, & definitely one of Quentin Tarantino's best films. Jackson plays Marquis Warren, a bounty hunter who was a former Union soldier in the Civil War. He is trying to transport 3 corpses to Red Rock, Wyoming, to get a reward. Along the way to Red Rock, he finds a stagecoach driven by O.B. (played by James Parks). Inside the stagecoach are fellow bounty hunter John "The Hangman" Ruth (played by Kurt Russell), & fugitive Daisy Domergue (played by Jennifer Jason Leigh). Warren & Ruth had previously met each other in Chattanooga, Tennessee some months prior. The 3 are now going to travel to Minnie's Haberdashery to take shelter during an upcoming blizzard. On the way to Minnie's, they encounter the new sheriff of Red Rock, Chris Mannix (played by Walton Goggins), & he comes along with them. Mannix was previously part of a group called the "Mannix Marauders", who terrorized South Carolina during the Civil War. They arrive at Minnie's, eventually finding that it is in the hands of a Mexican named Bob (played by Demián Bichir). The others at Minnie's are: hangman Oswaldo Mobray (played by Tim Roth); cow-puncher Joe Gage (played by Michael Madsen); & former Confederate general Sanford Smithers (played by Bruce Dern). Ruth eventually gets the feeling that one of the people there is trying to free Daisy, & since they will all be stuck at Minnie's for the next couple days due to the blizzard, they all become tense towards one another. The film was purely excellent. The acting, especially from Jackson, Russell, Leigh & Goggins is excellent. 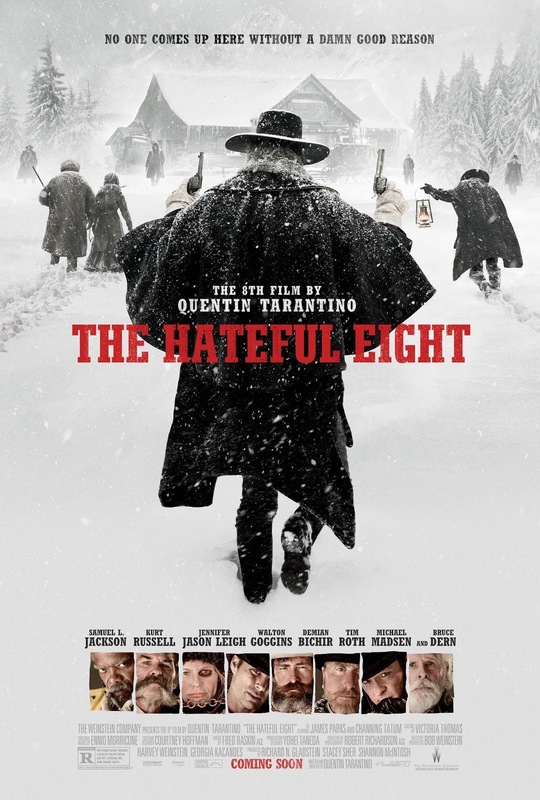 The direction & screenplay from Quentin Tarantino is top-notch, as always. The cinematography from Robert Richardson is excellent, & is really special because of the fact that it was shot on 70mm film (which made the film even better). The score from master Ennio Morricone was amazing. Overall, this is one of the year's best films, & if you do see it, please see it in 70mm. You will not be disappointed.